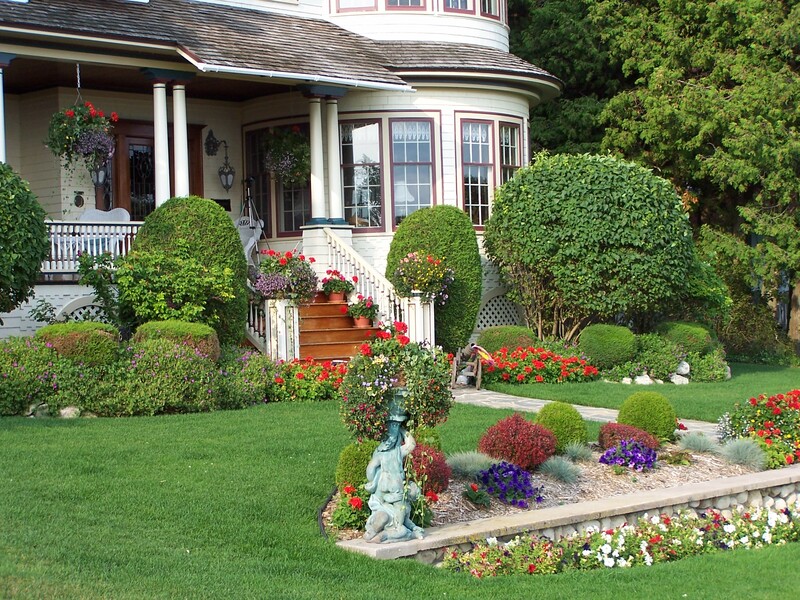 Victorian architecture is the prevailing style of Mackinac Island. Original buildings were built during the Victorian age, and new buildings have followed suit. 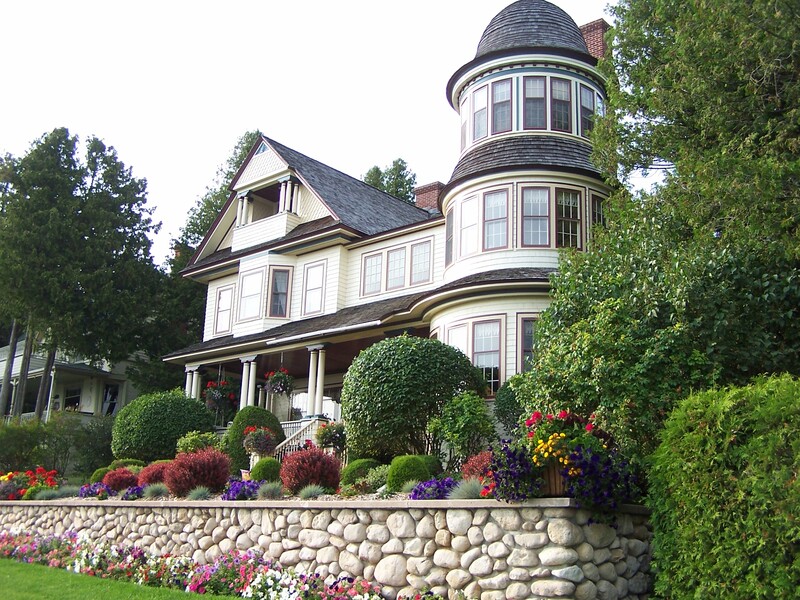 The result is a place that truly appears to be frozen in time, with lovely picturesque homes, hotels and bed and breakfasts, featuring turrets, towers, porches and widow’s walks. 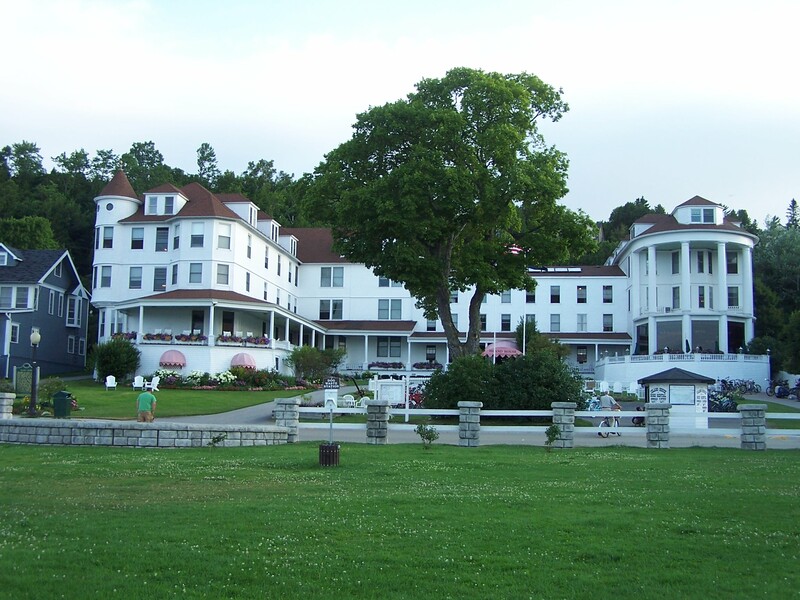 Although the Grand Hotel is the one everyone hears about, the Island House, built in 1852, was the first hotel on the island. This is where we stayed on our first anniversary and every time we’ve returned to the island since. The decor features painted Victorian style furniture, over-stuffed sofas in floral prints, and is comfortable and welcoming. There’s plenty of space to relax on the lawn and front porches, and at night there’s always a fire going for making s’mores. We always try to stay in one of the quaint fourth-floor rooms, tucked under the eaves, with angled ceilings and dormer windows. Definitely not a place for tall visitors, as anyone taller than me must take care to not bump their head on the sloped ceilings. An added bonus is the extra exercise we get, as the elevator only goes up to the third floor. The building is actually a collection of three buildings put together, so the inside is a delightful tangle of extra sets of stairs connecting all the floors which don’t quite match up. A grand looking home on the West Bluff. Pontiac's Trail starts here. This is one of the original Victorian mansions that can be seen high on the west bluff, as one approaches the island by boat. To get to the west bluff you’ll have to make the trek up the pretty decent, but doable hill of Cadotte Avenue, turn left behind the Grand Hotel, and take a few back streets to West Bluff Drive. You’ll get a great close up view of the beautiful west bluff homes and gardens. Most people don’t know about Pontiac’s Trail, a short, narrow walking path perched along the west bluff edge, that takes you right up to the front of some of the less visible west bluff homes. Once you’re done admiring the west bluff homes, make sure your brakes are in good working order, and take a wild, downhill ride down West Bluff Drive, into forbidden bike territory in front of the Grand Hotel, then coast all the way to the bottom into town. Best not to stop on the way down so you won’t get caught by the Grand Hotel guards! East Bluff home and gardens. 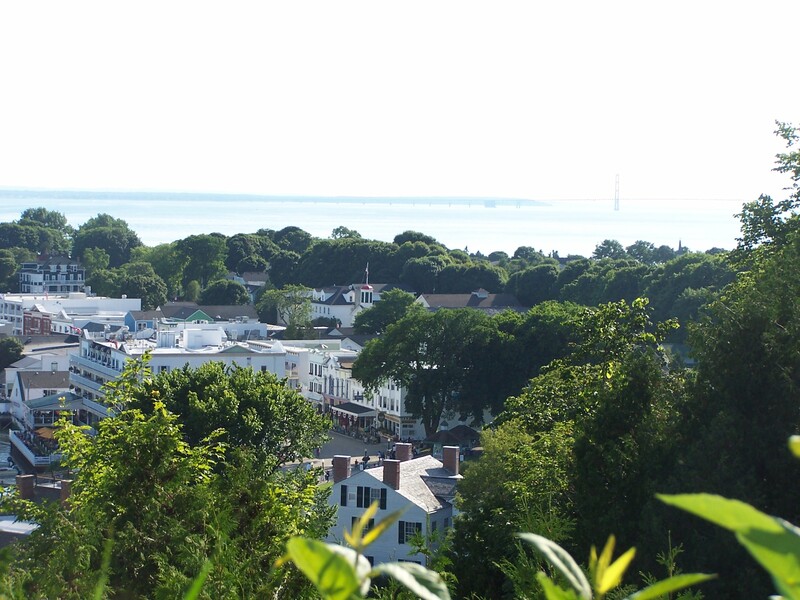 A harder uphill trip at the straight up road by Fort Mackinac (don’t worry – even the Huffys had to walk up the last little bit), then behind the fort to East Bluff Drive, takes you to another picturesque area of original homes and gardens. Many visitors never see these homes up close, deterred by the steep road leading up, and even steeper one leading down. An alternate route is to ascend Cadotte Avenue by the Grand Hotel, then wind your way around the upper interior roads to the East Bluff, but many visitors don’t bike far enough into the interior to figure this out. Or, if you don’t mind walking, there’s a steep set of stairs tucked behind the bushes at the bottom of Truscott Street. When you’re done admiring the east bluff homes, make a sharp turn onto Truscott Street, just past the sign that says something like “Absolutely no biking; walk bikes down” and take a cautious ride down with both hands firmly on your brakes. My life flashed before my eyes on the steepest part, but hey, it was worth it. Rooftops of the town below, seen from east bluff. 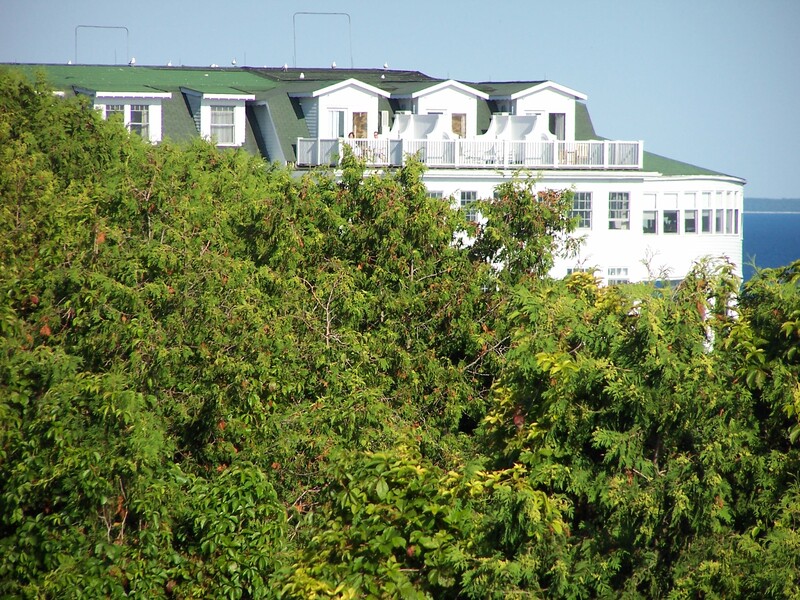 Back of the Grand Hotel, seen from west bluff. Note the roof top balconies for some lucky guests! Round Island lighthouse and harbor, seen from east bluff. 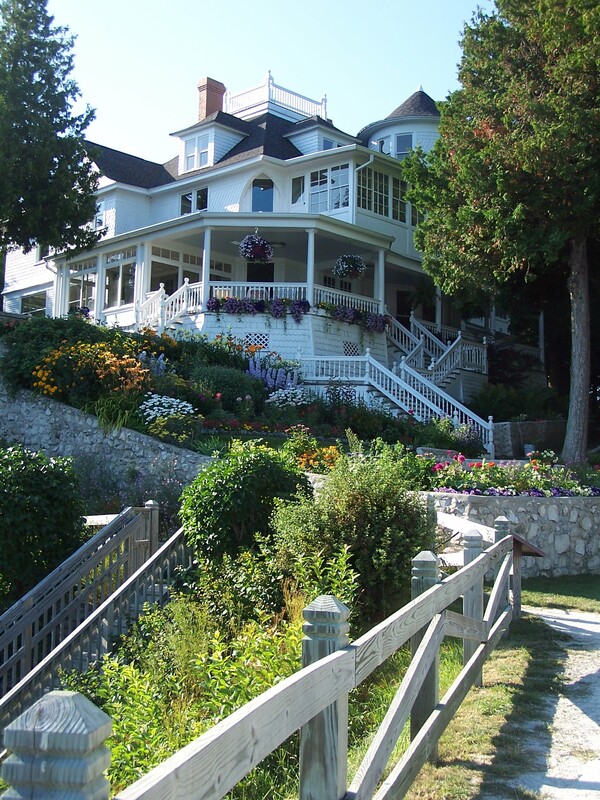 This entry was posted in Nature, Photos and tagged Gardens, Grand Hotel (Mackinac Island), Island House, Mackinac Island, postaweek2011, Victorian architecture by Huffygirl. Bookmark the permalink. This makes me want to go back sometime and see all this! Great post! My husband and I are going to visit the island in June and you showed us some great places for me to take photos. I write a travel blog here (Adventures in Travel) and this post helps me a lot in my trip planning. Thanks again! Thanks Laurie. 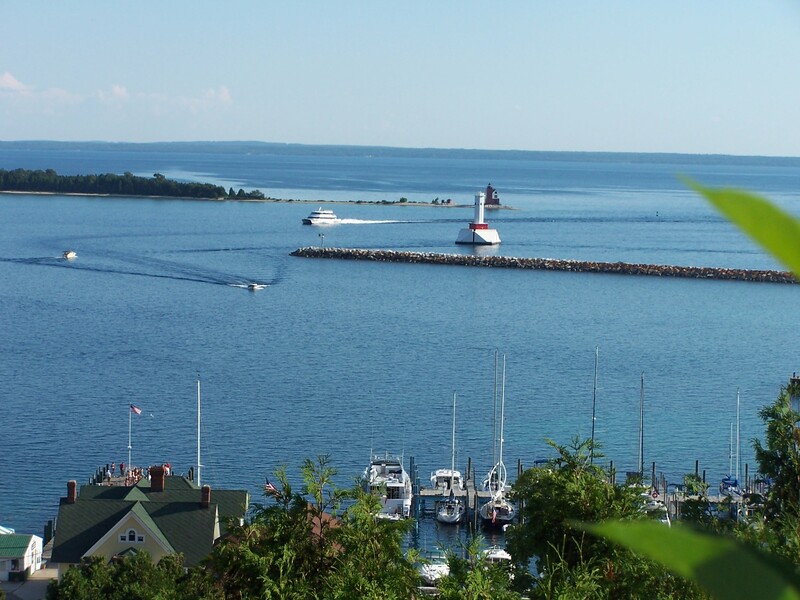 Mackinac Island (pronounced Mackinaw) is a great place to visit and take photos. I hope you enjoy your trip. Our bridge is also a great photo op; I never get tired of shooting it. I wish you could too. Although winter there is a different story – very snowy and cold, and much harder to get back and forth from the mainland to the island. You might not like that part. I’ve never experienced snow so yea I don’t know. From here it sounds fun you know. Snow can be lots of fun if you don’t mind being out in the cold. It can also be a real pain if the roads are snowed in and you can’t get out, or if you’re always shoveling it. I think you would like snow and are young enough to learn to ski or snowboard, as long as you didn’t mind the cold part. It has to be at least 32 degrees Farenheit for snow to stick to stay around, and most of the time up there it’s probably 15-25 degrees. Well, you’re all set then. That’s exactly what I do when it’s winter here. Although if you ever do get where there is snow, you really should at least try some sledding or skiing, and have a snowball fight with your friends. Your post is such a beautiful glimpse of a place I hope to visit. Thanks. Thanks. I hope you get there soon.